I don’t know who coined this idiom or the real story behind it. Maybe if I knew, I wouldn’t disagree so much with it. In any case, I want to describe in this article my perspective on the idea of ‘fake it ‘til you make it’ and the possible problems it entails. I suspect that the underlying reason that leads some people to go for fake it ‘til you make it is one that many people struggle with. I’m convinced, however, that the issue can be dealt with in a much kinder and easier way. Kinder to yourself, and easier for the people around you. I reason why people opt for ‘fake it ‘til you make it’ is because they don’t feel good enough – in a specific situation, context or on an interpersonal level. If you believe that you’re not good enough, this believe also has an embodied expression that is unique to you. It’s your way of being shy or insecure. Because this is not a very comfortable situation to be in, you’re thinking of a way out. Much like the grass that’s greener on the other side, in embodied terms the opposing feeling is what you think will make it better and where you should be. So you try to overcome your insecurity by pretending the opposite. HOW WILL YOU POSE AS CONFIDENT? You don’t want to feel inadequate and inconfident, so you believe the solution is to be confident. At least act like it, right!? And this idea of confidence – what you believe it should look and feel like – is made up of images from your past experiences. Frequently, it’s the essence you stored in your memory of what you’ve seen others do when you thought they acted confidently or in situations when you felt insecure in the past, and you believed the other – more dominant person – was confident. One of the problems I have with fake it ‘til you make it is that it doesn’t support you in achieving alignment of your mindset, actions, your emotional state and your physical being. The alignment of those four elements is what I would term confidence or authenticity. And I can’t give them an answer. Because I wouldn’t know how they should be. I don’t think the right answers exist to those questions. If you are aware of your body, you’ll know or feel how to be to be your best self. You can move out of it and find a healthy way of being confident. And on this journey I can be a guide. I’M NOT A FAN OF POSING. 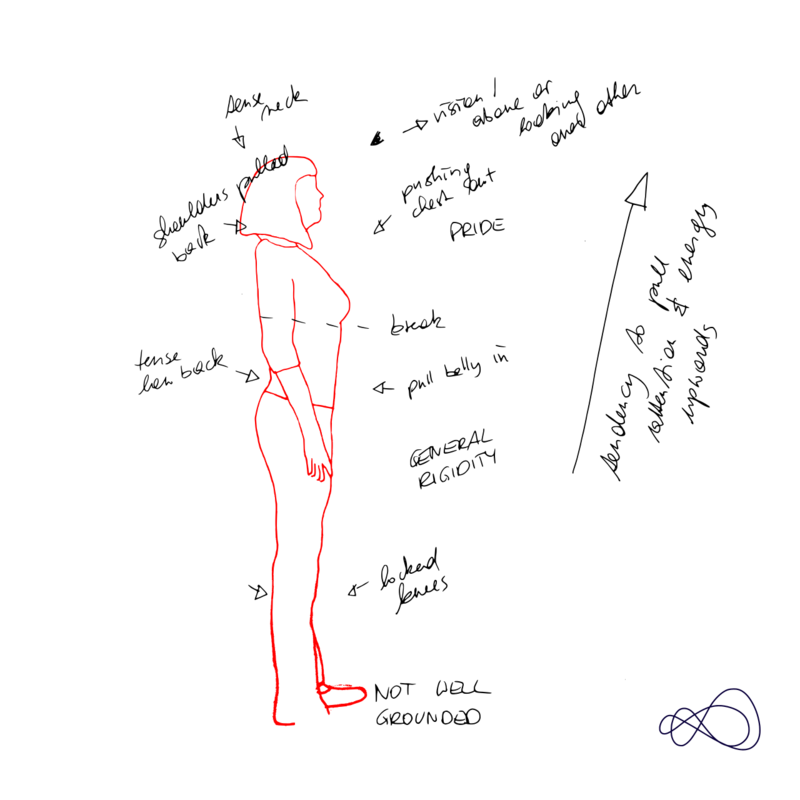 Poses or any other gesture or fake-it tools can work, but only if you actually embody them. And then it’s not fake any more. In the long-haul posing or postures should lead to change. And then it’s – in my opinion – not a faking it that brought you to a different place but the fact that you have become a different person along the way. I personally wouldn’t feel comfortable in ‘fake it ‘til you make it’ mode. I don’t think it is the coolest way to show yourself. Nor is it pleasant for the people you are with, because they won’t get to see the real you, just the image. It’s inauthentic and creates distance. When a person I meet, let’s say, at a networking event, is trying to impress me or whoever their conversational partner is, they are primarily busy with themselves. Maintaining a confident pose while they actually might feel shy or insecure about something, is exhausting. And their mind might be full of self-talk and not be open to a real conversation. I prefer honest and authentic encounters. If it’s a success or a problem I’m discussing, I enjoy having conversations about real stuff. 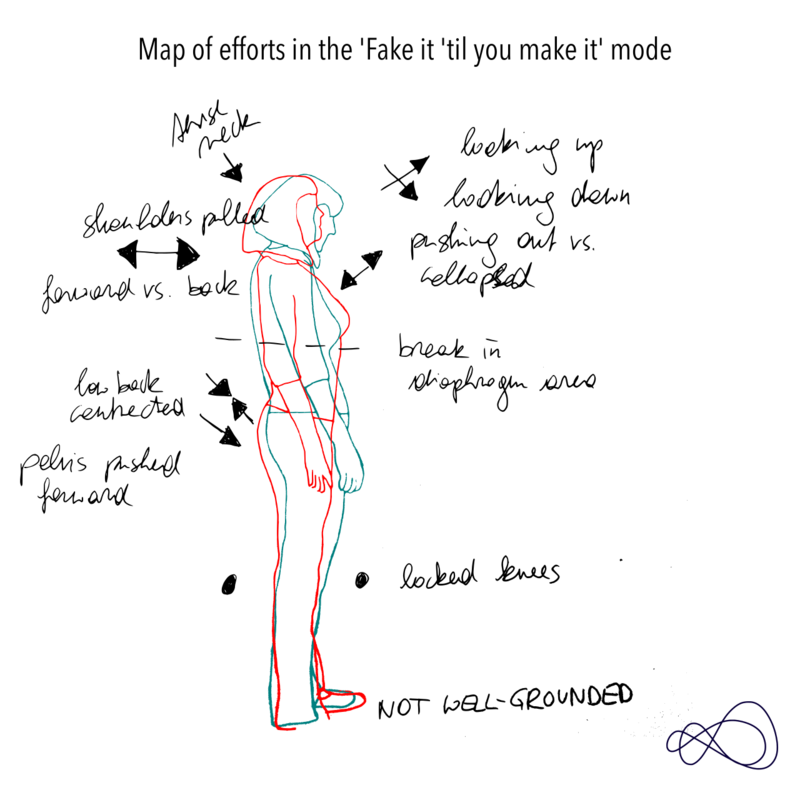 When you are in a “fake it till you make it” mode, it doesn’t only show in your posture, it will show in how you speak, what you address, and your mood. And for the body the sum of all this and the physical tensions you need to make to not fall into your insecure posture, makes you self-absorbed. It makes it difficult to pay attention to other people. THERE IS NO SPACE FOR AN HONEST ENCOUNTER. It might be more difficult for you in your cool or fake-it confident persona to identify the people you really want to talk. Not being fully yourself might let you act according what you think you should do. And if you do meet the right people, they won’t really see you. Because you’re not fully yourself. Let’s assume you went to this event, because you are looking for ideas of how to deal with a problem you’re facing right now. And you go there in your fake it ‘til you make it state: Part of the persona will not want to talk about problems but just want show off how good you are. I’m sure you’re good at many things, but talking about that stuff might not get you what you want or why you went there in the first place. I woud any time go for an honest conversation. No fluff. When you’re mostly busy with yourself and trying to play confident, how much of your attention is left for the other person? You came to the event because you wanted to meet new interesting people or make relevant connections or get ideas, right?! When most of your attention is focused on yourself, how are others supposed to notice you? Or feel appreciated or welcome to the conversation? You need to choose what your priority is: appearing cool or confident or actually getting to know another person? Or asking relevant questions? Being real. In the following I want to show you a few illustrations that show the physical efforts you maintain in each of the postures. And I’m not addressing the strain that your thinking and emotional state can add to this. IMAGE 1: The efforts in the body in an insecure posture. It’s not the same for everyone – thi is just one example from experience. But generally the same areas are likely to be affected. 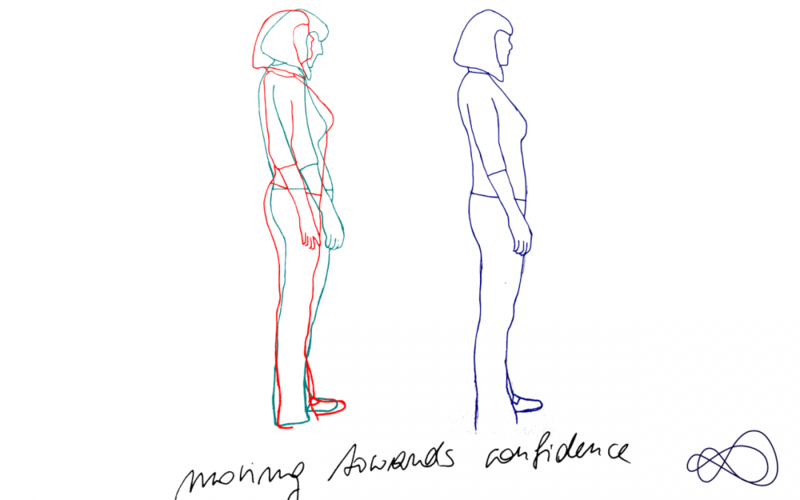 This shy posture will impact how you see others (bigger, stronger, intimidating), how you relate to them (e.g. feel inferior or uninteresting) and how you act (staying in a corner). I’m sorry I use such clichés in the examples – it’s to give you an idea of the different extreme forces at work that make the situation exhausting. Please feel free to replace them with how you feel in a relevant situation. This will make it more practical and insightful for you. 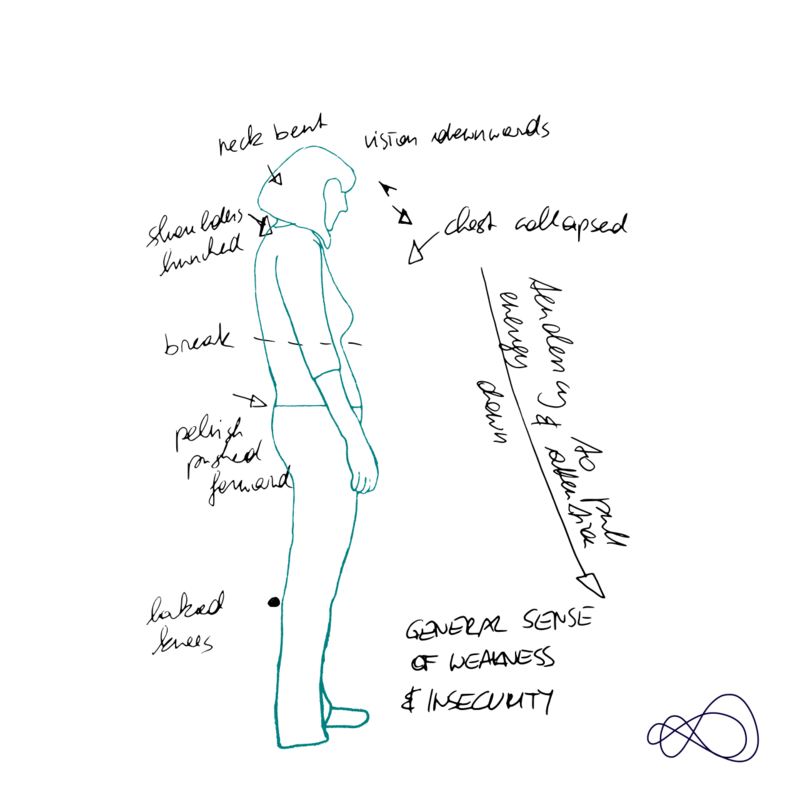 IMAGE 2 : The efforts in the body in a pretend confidence posture. Doesn’t look too much fun, right? And it’s also not very energy efficient. In the fake confidence posture you might feel better than in the insecure one, but you could also give off vibes of being distant or arrogant. You won’t have the same ability to relate to your conversation partner or be in touch with your intuition who you’d like to talk to. In reality, you might be making double the effort at once, because inside you still feel like in the first picture, but to the outside world you show yourself a different ways. This leads to a lot of strain for your body, because in your ‘fake it ’til you make it’ mode you are maintaining contradictory stances at once. One issue of fake it ‘til you make it is that there’s an end to the faking state (anything else would be too exhausting). So what happens afterwards? You went through a meeting with your power poses, but underneath you were the same shy person. Even if you got good responses, you got them for not being yourself. It doesn’t boost your confidence. It means you’re doing OK when you’re pretending, not being yourself. What might happen if you practice ‘fake it til you make it’ is comparable to the yo-yo effect of a diet. You don’t feel well, so you decide to do something about it: you go on a diet – which might push you to do things you wouldn’t naturally – and after 3 weeks the program is over and you fall back into old habits and feeling the same uncomfortable way as before. It’s great that you want to change something, but the tools with which you want to accomplish this goal, and possibly even more importantly the attitude and attention you are applying to the change process, will greatly impact the outcome and if it will lead to lasting results. In my opinion, ‘fake it ’til you make it’ is at best a short-term strategy. You don’t need to fake anything to become confident. I believe the solution is much simpler: let go of the patterns that don’t allow you to be confident. You don’t have to add stuff or try to be the opposite how you feel. It’s about dropping the layers that you acquired over time that don’t serve you any more. It’s like peeling the onion layers that you developed – usually for good reason at some point – but that no longer serve you and stay between you and your confidence. The option of letting go is not the easiest, because it will confront you with the real stuff that made you put your guard on in the first place. But they are there anyways, and is definitely more energy efficient and confidence-boosting than ignoring it. Agree to how you feel and do it anyway. It’s less harsh for yourself and your body but also for other people. The gentler way of going about a situation where you feel inadequate, insecure or out of your depth, is to go through the motions. The body relaxes when you agree to your experience in the moment. Agreeing to feel insecure can lead to confidence (in a different but healthier and more natural way than what you imagine it to be like when you feel the opposite.) You could also say that confidence is a state where you agree to the what-is instead of fighting it. instead of move between the yo-yo extremes. Don’t push yourself too much. You can still set high goals for yourself and give your best. If you get stuck in a moment where you feel your insecurity coming on, breathe with it and embrace it as part of the journey. Don’t beat yourself up when you don’t feel great, but check in your body and in reality if there’s something you can do to take the next step. Why ‘fake it ‘til you make it’ is bad advice – Inc. If you want guidance on how to gain confidence, you can click here to get a free 30-minute online consultation. If you want to work with me, so you can find your own way and guidelines to confidence and success, I have something special for you: Make your own rules for success. It is an intensive one-to-one weekend course, consisting of 5 one-to-one sessions.